A complete vitamin and mineral complex that helps correct stress related and calcium deficient problems in captive reptiles. No artificial additives! Calcium based to ensure healthy bone growth and help prevent rickets. 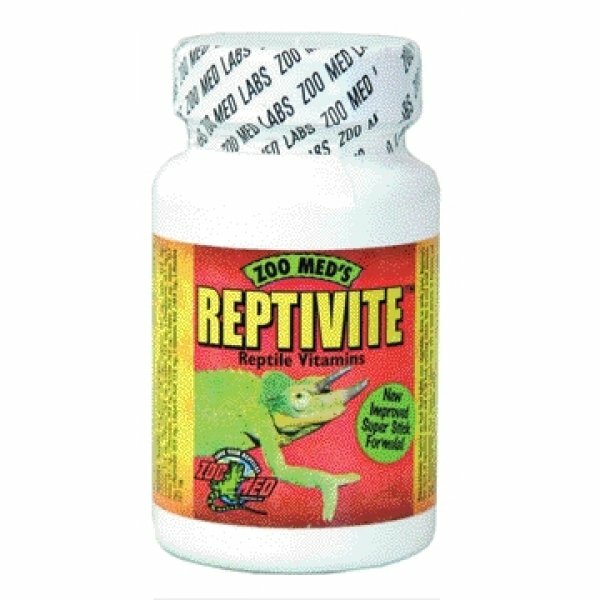 Reptivite Reptile Vitamins has different options and/or variations, please choose below. A complete vitamin and mineral complex that helps correct stress related and calcium deficient problems in captive reptiles. No artificial additives! Calcium based to ensure healthy bone growth and help prevent rickets. Also protects metabolic functions, helps in skin shedding and aids in preventing liver problems. Correct 2:1 calcium to phosphorus ratio. Originally developed for the San Diego Zoo for use with soft-shell problems in turtles! Currently used by some of the most respected zoos and animal parks in the U.S. and Europe. All human grade vitamins and minerals used with no added fillers like soy, yeast or sucrose (sugar). 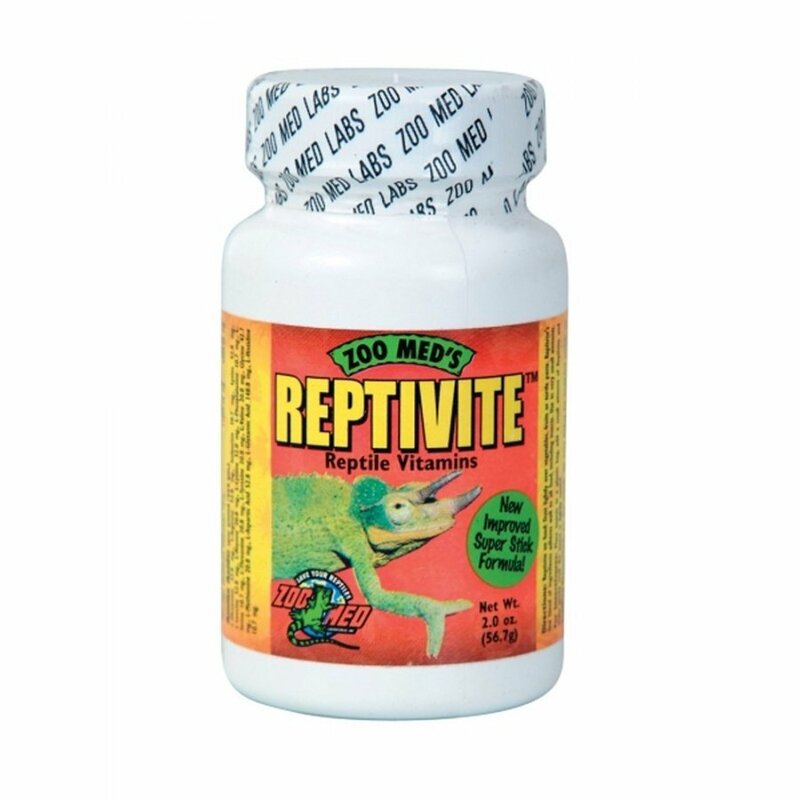 This means that you can add Reptivite to your reptiles diet less often. Directions: Reptivite on food: Dust lightly over vegetables, fruits or turtle paste. Reptivite's fine blend of ingredients adheres well to all food, including insects. Use in very small amounts. For Insectivores: Place insects in a plastic bag, add a small amount of Reptivite and shake gently until the insect is lightly coated. Feeding Frequency: For new animals, use every feeding. For established animals, use every other feeding. Ingredients: Calcium carbonate, Dicalcium phosphate, Potassium chloride, Sodium chloride, Dessicated liver, Ascorbic acid, Magnesium oxide, Isoleucine, L-Phenylalanine, L-Serine, L-Histidine, Dicalcium pantothenate, Choline bitartrate, Lecithin, Niacin, Ferrous fumerate, Zinc oxide, Copper sulfate, L-Glutamic acid, Riboflavin, dl-Alpha tocopherol acetate, Thiamine HCl, L-Arginine, Lysine, L-Leucine, L-Aspartic acid, Folic acid, Glycine, Manganese carbonate, L-Glutamine, L-Cystine, Pyridoxine HCl, Fish Liver Oil, L-Alanine, L-Threonine, L-Tryptophan, L-Tyrosine, L-Valine, L-Methionine, Cholecalciferol, Biotin, Cyanocobalamine, Kelp. Vitamin A (Fish Liver Oil) 100,000 I.U. Vitamin D3 (Cholecalciferol) 10,400 I.U. Vitamin E (dl-Alpha Tocopherol Acetate )100 I.U. Vitamin C (Ascorbic Acid) 1400.00 mg.
Vitamin B1 (Thiamine HCl )75.20 mg.
Vitamin B2 (Riboflavin) 124.80 mg.
Vitamin B6 (Pyridoxine HCl) 30.40 mg.
Vitamin B12 (Cyanocobalamine) 3040.00 mcg. Pantothenic Acid (Dicalcium Pantothenate) 849.60 mg.
Phosphorus (Dicalcium Phosphate) (10.6%) 48.00 gm. Iodine (Kelp) (.0002%) 960.00 mcg. Iron (Ferrous Fumerate) (.045%) 200.00 mg.
Magnesium (Oxide) (.26%) 1200.00 mg.
Copper (Sulfate ) (.045%) 200.00 mg.
Manganese (Carbonate) (.0077%) 35.20 mg. Sodium (Chloride) (1.63% )7400.00 mg.
Zinc (Oxide) (.045%) 200.00 mg.
Potassium (Chloride) (1.76% )8000.00 mg.
Amino Acids: L-Glutamine 32.0 mg., L-Arginine 52.8 mg., Isoleucine 10.7 mg., Lysine 52.8 mg., L-Leucine 52.8 mg., L-Alanine 20.8 mg., L-Cystine 32.0 mg., L-Phenylalanine 10.7 mg., L-Serine 10.7 mg., L-Threonine 20.8 mg., L-Tryptophan 20.8 mg., L-Tyrosine 20.8 mg., L-Valine 20.8 mg., Glycine 42.7 mg., L-Methionine 20.8 mg., L-Aspartic Acid 52.8 mg., L-Glutamic Acid 148.8 mg., L-Histidine 10.7 mg.